Your steak has already been killed. This post isn’t going to have some silly story to start it off with. The purpose of this post is to prevent something that happens all of the time from happening again…killing dead meat. I’m sure I will catch some flak from some vegans out there, but if you like a good steak, you will read on. It looks even better on the inside. The first and foremost problem is heat control. The whole process of bringing something from the temperature of your refrigerator to an edible and safe temperature can be a daunting task I know, but we’ll get through this together. These steps apply to just about any cut of meat that doesn’t take 4 hours of roasting to tenderize. Filet mignon, ribeye, New York strip, flank, etc… It should also be noted that these rules cover thick cut pork chops too, just cook them to at least 145 degrees (the FDA just lowered the safe temp on pork). 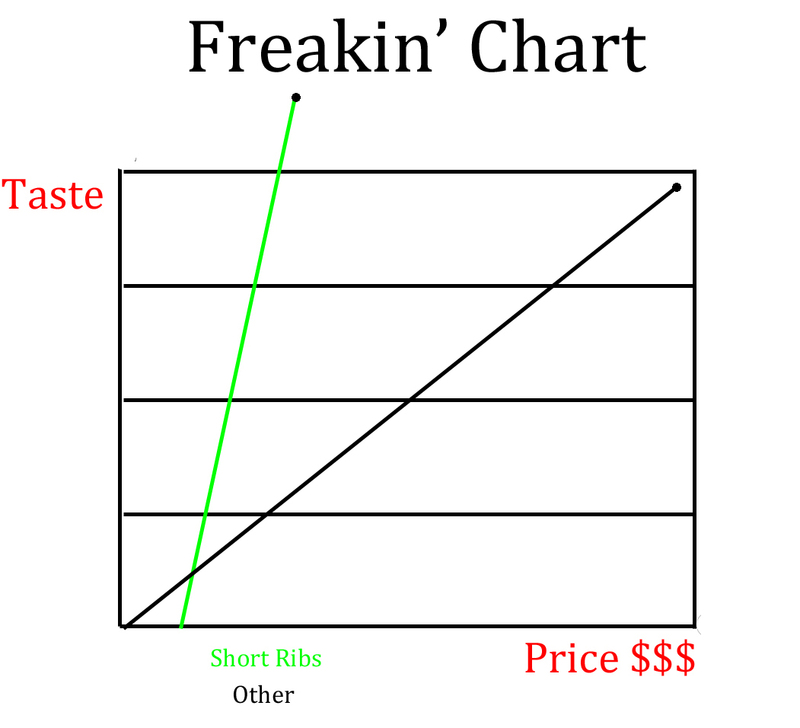 Step 1: Buy good steaks. Ask the butcher to cut what you want, since what he cut yesterday and is already in the case isn’t quite thick/thin enough. Sure, they will cost some good coin, but it will still be half the cost of an fancy place that sounds like Roofs Christ, which is essentially overpriced meat with a stick of butter. Step 2: Bring the meat to room temperature. Let it sit out of the fridge for at least 30 minutes (turn a bowl over on it if you’re worried about bugs or whatever getting to it). This will prevent having a raw center and a well done outer layer of the steak. You should be able to get medium-rare the whole way through. Step 3: Dry off the meat with paper towels and season just before cooking. This helps make a good sear. When seasoning, take the thickness of the cut into account. The thicker the cut, the more salt/seasoning it needs. Seasoning is a personal preference, however I do stay away from the pre-mixed spice concoctions as a steak should taste like meat. Step 4: Use a fat or oil with a high smoke point (no olive oil). I use bacon grease or canola oil. Step 5: For thick cuts (over an inch thick) I sear over high heat and then oven roast in a cold pan at 300 degrees until I achieve the correct doneness. Putting the steak in a cold pan before the oven prevents overcooking one side of the steak. For thinner cuts, I use medium pan heat and only turn it over once, no oven. Step 6: After you have made this long journey to greatness, let the steak take a break before you eat it (5-10 minutes). This will prevent the juiciness from running all over you plate. Besides, it was killed, cut, burned and is about to be eaten… Let it have a rested farewell. DO NOT poke the steak with anything other than a thermometer while cooking, only use a thermometer if you don’t know how to test doneness by touching the steak. There is a way to compare the firmness of your palm to the steak to tell doneness. I recommend using a thermometer first, and practicing the “firmness test” to get it right. DO NOT smash the steak down with a spatula, brick or anything for that matter. Just let the thing cook would ya? DO NOT cook a filet well-done, I will personally tell your butcher to stop wasting good meat on you. DO NOT do this in a non-stick pan. The high heat you need is too high for Teflon and it will turn into a gas that will make you sick. Use either stainless, anodized, or cast iron cookware. These types of pans also encourage the development of “fond”. Fond is the French term for the browned bits you get in the pan by searing a steak, which help add a lot of flavor to sauces. The recipe for this post is one of my favorites and is my usual go-to for having people over. 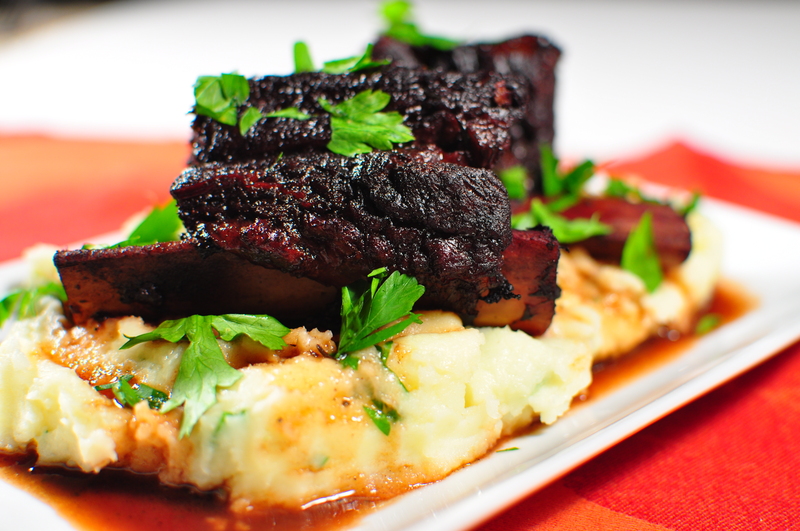 It is spicy, but the port sauce adds a sweetness to it that keeps everybody eating. Have plenty of red wine to wash it all down. The only downside to the recipe is that it creates a hell of a lot of smoke while you are essentially burning peppercorns, so if you don’t have a good exhaust fan, open some windows- stat. Drum roll please…. 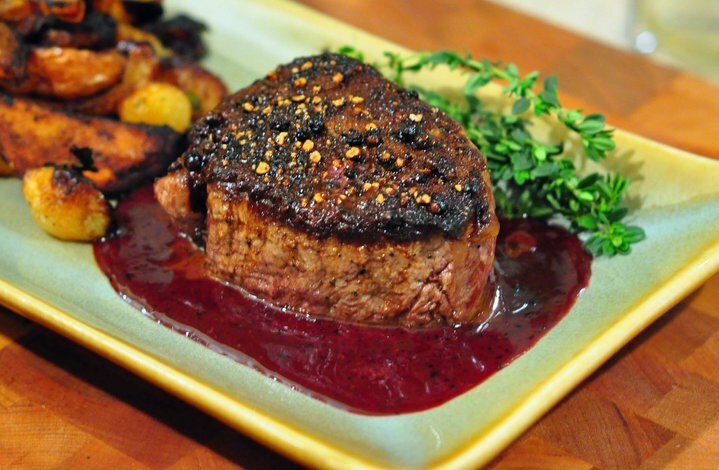 Recipe for: Pepper Crusted Filet Mignon with a Port Cream reduction (for 4 lucky people). Pre-heat oven to 300. You should have taken the steaks out of the fridge already, like half an hour ago, did you!? If the steaks are wrapped in bacon, remove the bacon and cook it over medium heat to render out the fat in a stainless skillet large enough to fit all of your meat. Leave the fat in the pan and eat the bacon when nobody is looking. Season the steaks liberally with salt, onion powder and garlic. Put the crushed peppercorns on a small plate and shake the plate to make an even layer. Press the steaks gently into the peppercorns so they stick to the meat. Heat the skillet with the bacon fat to high heat until it is just barely smoking. Turn on your fans, place the steaks in the hot pan and sear for two minutes per side (do this in two batches if your skillet isn’t big enough). Remove steaks and put them in another cold, oven safe pan. Pour off any excess grease from the skillet, but leave any burnt bits or peppercorns in there, then return the skillet to medium heat. If you have a splatter screen, now is the time to use it… Pour in the Port, it will steam, hiss and scare the pets, this is ok. If you have gas burners you may want to turn off the flame to avoid it igniting and melting the door of your microwave off. Once it calms down, using a whisk, break up all of the browned bits from the bottom of the pan and bring it to a light boil to reduce. Place the steaks in the oven and bake until an internal temperature of 125 degrees is reached; it should be about 10 minutes, but use your thermometer. While the steaks are in the oven keep an eye on your sauce, making sure you maintain a high simmer whisking occasionally, as the liquid reduces, you will need less heat and it will burn easily. Once the wine has reduced by half, you will see the bubbles start stacking up on each other; when you whisk it, you will start seeing the bottom of your pan. Turn the heat down to low and whisk in the cream. Taste it. Does it need salt? Is it too runny and it needs to reduce more? Is it too thick and you need to add more wine? Figure it out. Keep it on low heat until the steaks are done (which this takes about 10 minutes, oddly about the same time it takes to bake the steaks). Once you have reached 125 degrees, remove steaks from oven and wrap in foil and DO NOT touch them for 10 minutes. The temperature will coast up to a perfect medium rare and I will not tell you how to cook filet to any other temperature, sorry. Pour your sauce onto four plates, unwrap steaks and set them in your little puddle of sauce. Any juices accumulated in the foil can be poured over the top of the steaks or sopped up with a dinner roll. Cut into your steak, show your friends and bask in glory. If you have any unfortunate souls with you that want their steak cooked more, show them how to use the microwave ruin the steak and don’t have them over ever again. Why yes, you do need a meat slicer. There you are with a little ticket in your hand with the number 962. You look up at the “Now Serving” sign, 843. Yes, you are at the deli counter of pretty much any stupermarket around. You notice that all of those oval shaped meat products (shapes unlike any animal I’ve ever seen, besides my cat) in the case are somewhere between 9 and 14 dollars a pound. Then you read about sodium, nitrates, nitrites, blah blah blah. What are you doing here!?! Why are you standing in line for something that costs so much and is bad for you? Convenience. Now trust me, I can relate on many levels of wanting to do things easier, but deli meat isn’t one of them. With the right tools, you can create your own sandwiches in no time. I’m not saying you need to go buy one of those 10 inch blade chrome model meat slicers. I got mine for 80 bucks, and it works great for cheese (cheaper in block form), slicing vegetables for pizzas or slaw, and raw beef-ribeye for cheese steaks. Other than the slicer, you need a probe thermometer (15 bucks) and a syringe of some sort. The syringe can come in the form of a “flavor injector” from an unmentioned kitchen store for 30 bucks, or a large gauge hypodermic from, say, medical personnel you may know (for free). 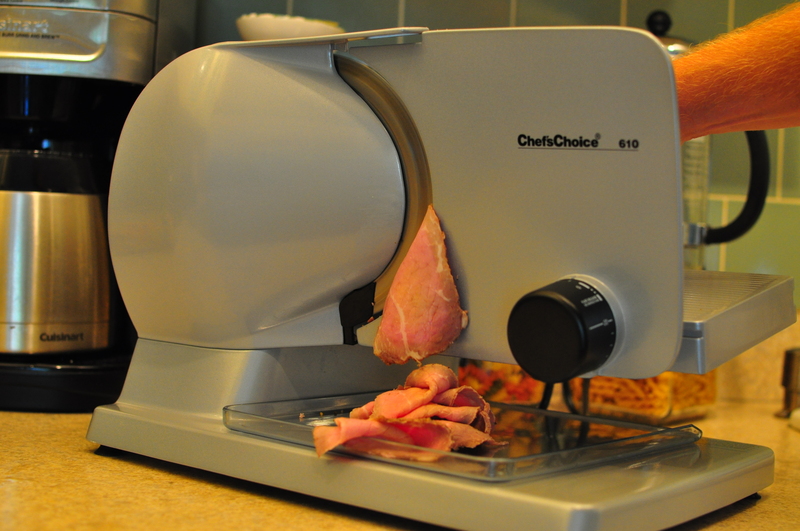 Now, I know what you are thinking….Where the HE** am I going to PUT a meat slicer? Well, the bread machine can go. The smoothie machine parked next to a perfectly good blender can go. The 5 boxes of Ho-Hos can go. The margarita machine can go…..no wait, keep that. You get the point. I have figured that my slicer paid for itself within the first couple of months of having it. Just watch out for when beef round roasts go on sale for like 1.99 a pound or when whole turkey breasts are 7 bucks for a 3 pounder. I’m not hanging up whole hog legs in the basement (yet) but if you want ham, it is still cheaper to get it whole than pre-sliced. You can cut it as thick or thin as you want and then freeze it in “however many sandwiches you make a day portions”. Take the roast out of the fridge 1 hour before cooking so it will come to room temp. In a small saucepan, combine the broth and spices over low heat until the salt dissolves and you can smell the other spices. 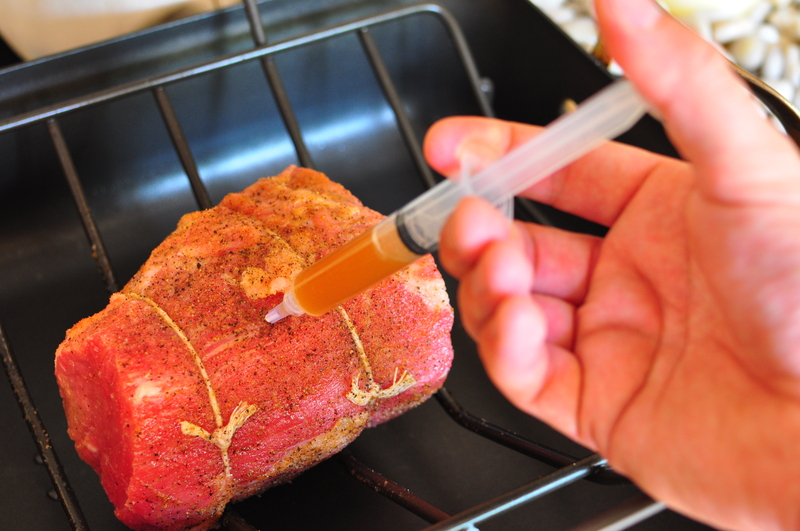 Using a syringe, pump the brine into the roast in multiple locations. Some of the brine will squirt out in various directions, so you may want to do this in the sink. Dry off the roast with paper towels, rub it with vegetable oil and then season the outside liberally with additional salt, pepper, onion powder and garlic. 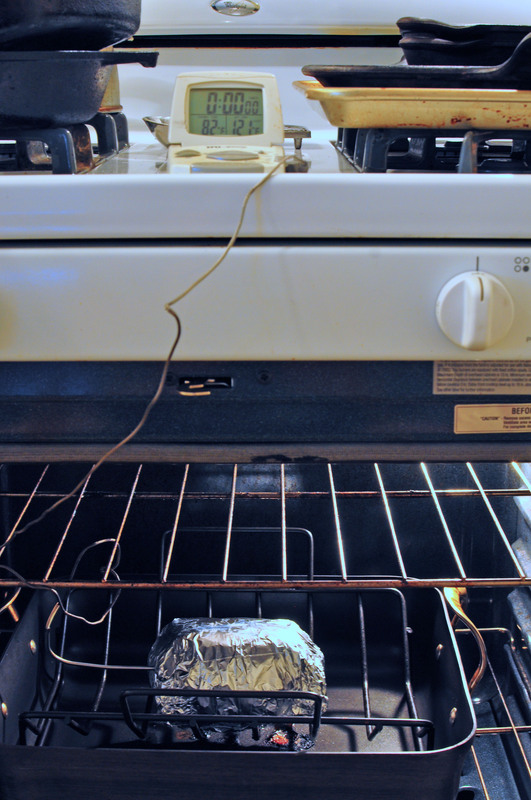 Preheat oven to 500 (if you haven’t cleaned your oven lately, you are about to). Place roast in a rack and bake at 500 for 20 minutes to get a nice crust on the outside. Take the roast out and lower oven temp to 225 leaving the door open to let the high heat out. Wrap the roast tightly in 3 layers of foil, insert a probe thermometer and bake until an internal temp of 120 degrees is reached which will be somewhere around 1 1/2 hours depending on your oven and size of roast. Take the roast out of the oven and leave it wrapped up in the foil and the temp will coast up to around 130 (medium rare). Do not unwrap it until the temp goes below 100 degrees. Put it in the fridge overnight and slice the next day (I know, this is tough). My favorite sandwich using this roast beef is a beef and cheddar with horseradish mayo. Just stir in a teaspoon of prepared horseradish into a 1/4 cup of mayo. 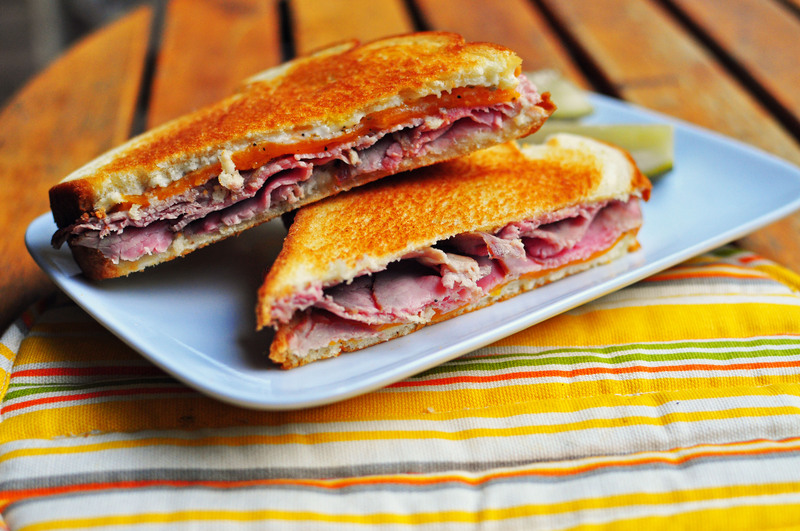 Spread mayo on 2 pieces of bread, pile roast beef high and throw a couple of slices of thin sliced cheddar on it. Butter the outsides of the sandwich and grill until browned and the cheese melts. Number one – 90% of the people I know still buy spices and dried herbs at the grocery store. Why is this so bad you might ask? Well, what you are buying in your local grocery store has probably already been sitting on the shelves for 6 months. You should throw out ground spices after 6 months, and whole spices after a year. The selling price of these seasonings are 3 times the cost of what they are worth! Then once you take them home, you have to use 3 times the amount to get the flavor you want (not to mention they use fillers and stabilizers). Number two – Pre-mixed seasonings are, for the most part, a complete rip off. I’m talking about your “Turkey Lurkey Grillin’ Spice” or “Rub It All Over Everything Spice”. I once saw a grilling spice from a certain kitchen store (that will not be mentioned) with a price tag of 16 dollars for 4 ounces of the stuff. What was the first ingredient? Salt. Salt is 4 dollars a pound! So my future to becoming a millionaire is to come up with a spice concoction and have it sold at that very unmentioned kitchen store. So what is the solution to my rants and raves? Buy spices and herbs from a spice dealer. Reputation is on the line for them; if the product you get is not fresh, you won’t be back. You can also buy the spices you use the most in bulk (not buying a container every time). This saves us money and is earth friendly. Your route to do this is to find either a local specialty store or buy online. I am fortunate enough to have a Penzey’s store only 2 miles up the road. Penzey’s is neat because you can walk in and “sniff around” and their prices can’t be beat. Penzey’s also has an online business too, which my Mom uses very regularly. 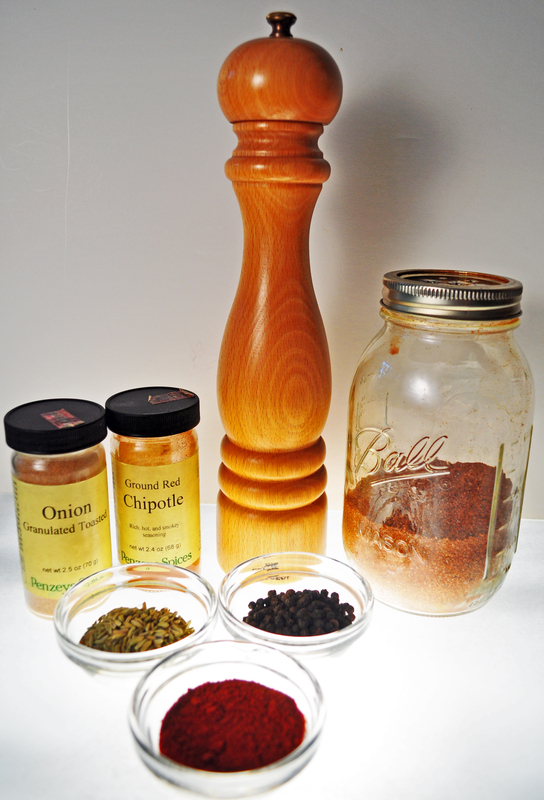 In my second seasoning lesson I will discuss grinding, storing, and what kind of spices mingle together with others. Ingredients for super secret spice rub: Makes plenty for at least 1 roast or a rack of ribs. It is easy to multiply so make extra! Put it all in a canning jar and shake to mix together. If the brown sugar is making it too clumpy, stir it up with a knife or ideally, a blade type coffee grinder. Punch holes in the lid to make a giant shaker, and then stack another lid on top of that to seal it up when not in use (thank you Alton Brown). Cover ribs or brisket liberally at least 3 hours before cooking, or up to 3 days if you have the time (trust me, you want to have the time).